The purpose of this letter is to respond on behalf of the Campaign for Clean Air in London to the consultation being carried out by the Department for Environment, Food and Rural Affairs (Defra) on the United Kingdom (UK) and Devolved Administrations’ draft report on plans and programmes to meet European Union (EU) ambient air quality limit values. The letter is addressed jointly to the Secretary of State for Transport because CAiL understands that the Department for Transport (DfT) has joint responsibility for the UK meeting its legal obligations in respect of air quality and the consultation document states that, historically, “In all cases, the exceedances were due to emissions from traffic”. 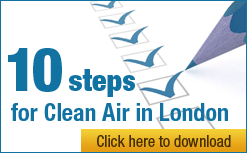 The Campaign for Clean Air in London (CCAL) notes the obligation under EU legislation referred to in the consultation document for the UK Government to produce plans and programmes to ensure compliance with the limit values “within the required timescale”. CCAL considers the last few words wholly misleading since “no time-extensions” are allowed. CCAL has two main concerns with the draft report which is the subject of this consultation. First, it does not show or refer to any expected date by which the UK will ensure compliance with any of the limit values. Second, the plans and programmes currently proposed together are clearly insufficient to meet the limit values or indeed to make any reasonable effort to do so. In CCAL’s view, the report does not meet the requirements of Annex IV of the relevant EU Directive. We are copying this letter to Commissioner Dimas and urge him please to reject the UK’s report, and to commence necessary enforcement action against the UK, unless these points are addressed fully in the submission as required by 31 December 2007. Furthermore, please will the Government reassure CCAL urgently that it is not seeking in the current final negotiations on the proposed new EU Air Quality Directive (which may conclude before 5 December 2007), any mechanisms that might mean that EU legal limits for air quality do not or will not continue to have full effect everywhere (e.g. in so called “hotspots” or at Heathrow airport) and is instead pressing vigorously in the defence of all “Three Red Lines” being insisted upon by CCAL (see pages 2 to 4 of this letter). It may be “now or never” to maintain current air quality protections. How can citizens have any confidence that the UK will meet any of its air pollution commitments, existing or proposed for either climate change or air quality, when the Government clearly does not show the political will necessary to educate the general public about the dangers of poor air quality or to incentivise and encourage the behavioural change necessary, on top of technologically driven solutions, to reduce urgently air pollution? The Government does not even seem to be willing or able to meet the legal requirement to produce plans and programmes for air quality to meet long standing, legally binding, commitments that were made as early as 1999 to meet air quality standards. The Prime Minister has been copied, given the cross-departmental issues raised and all London’s MEPs have been copied given the imminence of final decisions on the proposed new EU Air Quality Directive. Respectfully, given the seriousness of the issues raised, please will you each respond personally to the matters raised in this submission. CCAL has received support from Mayor Livingstone, leading politicians from the four main political parties in London as well as leading business and community groups including the Central London Partnership, London First and The Knightsbridge Business Group. We have also received a Pledge of support from Environment Protection UK (formerly the National Society for Clean Air and Environmental Protection). Our campaign website address is shown in the letterhead above. The European Commission announced on Wednesday 17 October 2007 that it [was] commencing action against the UK for breaching EU legal limits for PM10 having already sent the UK a first written warning for breaching EU legal limits for sulphur dioxide (SO2). The Commission’s statement made clear that it was considering further enforcement action but did not consider it appropriate to launch such action during the current negotiations on the proposed new EU Air Quality Directive (which are due to be concluded in December). You will be well aware that final negotiations are taking place currently between the Council of Ministers, the European Commission and the European Parliament about the proposed new EU Air Quality Directive which is intended to replace the current regime of some five air quality related EU Directives and provide a legal framework to address current breaches of EU legal limits for air quality for which no time extensions or derogations are allowed. CCAL understands that these negotiations are currently at a very sensitive stage since these parties are likely to want to reach agreement (“behind closed doors”) by the last date of 5 December to avoid a (probably controversial) second (and final) vote in the European Parliament a week later. In general, the proposed new EU Air Quality Directive is to be welcomed as a rationalisation of the existing legal framework and importantly because it proposes to target specifically reductions in the deadly fine particulate matter (PM2.5). However, you will be aware that CCAL is insisting upon “Three Red Lines” in respect of the proposed EU Air Quality Directive to protect citizens from fudge, loopholes and inaction under the new regime. If those “Three Red Lines” are not met, CCAL has urged the rejection of the proposed new EU Air Quality Directive in its entirety, which would mean, inter alia, that no time extensions would be allowed from meeting the UK’s current obligations, inter alia, for PM10 by January 2005 and for NO2 by January 2010.
any time extensions must be the minimum set by either The Council of Ministers or the European Parliament in their formal public announcements to-date e.g. three years after entry into force of the Directive for PM10 and must not, in any circumstances, include so called “two stage” time extensions which would have the (inevitable practical) consequence of making any first stage ineffective. It is vital that exposure reduction requirements for PM2.5 are set at no more than 20 ug/m3 with the PM10 limit value being lowered at least to 33 ug/m3. While it would be regrettable if the proposed new EU Air Quality Directive has to be dropped at the very last minute because it would breach these “Red Lines”, it would be much better for Londoners to rely on the Commission enforcing the current muddled regime of five EU Directives relating to Air Quality – which it has shown recently it is willing and able to do – than to live under a substantially weakened legal regime for air quality. Very significantly, CCAL heard recently that the UK Government has backtracked in the negotiations on the proposed new Directive, most probably, in respect of the “Second Red Line” above i.e. limit values in full effect everywhere. In particular, the Government may be pressing (behind closed doors) for a clause to ensure that “EU legal limits for air quality do not need to be measured everywhere”. This clause would be a clever/subtle way of removing the current obligation to meet these standards everywhere…without actually having to say so! Such a change is likely to provide a loophole for major infrastructure sites (such as Heathrow airport or the port at Rotterdam) and air pollution “hotspots” generally. Furthermore, it would make meaningless the Government’s commitment in The Future of Transport White Paper (2003), referred to on page 11 of the consultation document that “major new airport development could not proceed if there was evidence that it would be likely to result in breaches of the EU limits”. If the UK does not need to measure air quality everywhere, it is most unlikely that EU legal limits for air quality would apply at “hotspots” or Heathrow (or other major infrastructure sites in Europe e.g. the port of Rotterdam)! Such an approach would be totally unacceptable. It is very disappointing, after the achievements of the last ten years to establish a robust legal framework of tighter environmental protections across Europe, that the best we seem to be able to hope for now is that the existing legal regime should not be weakened under the current UK Government and that the Government should begin by producing plans and programmes to meet legal obligations it agreed to in 1999 that were missed in January 2005. We urge you both, and all those copied, to press the Government as a whole to take air quality seriously in the next few weeks as well as over the short, medium and longer term. Defra published on 2 November, its “2007 Survey of Public Attitudes and Behaviour towards the Environment”. Environment Minister Joan Ruddock commented that “The most encouraging finding in this survey is the majority of people believing that it’s up to individuals to accept responsibility by making lifestyle changes”. Again, like its desire for business to find technology solutions to improve air quality, it seems that the Government is looking for others to change not itself. Contrast the above position with the report published by Defra on 31 October on the Citizens Jury on Air Quality. This showed on page 21 that “By the end of the process there was a consensus that air quality is a more serious issue than any of the jurors had thought before they joined this jury. Furthermore, on a scale of concern from one (unconcerned) to ten (very concerned), most jurors had moved considerably up the scale. One of the breakout groups recorded this as moving from an Average Before of 2.83 to an Average After of 8.83. The reality is that this is yet another example showing the need for the Government to take responsibility for meeting its long standing legal obligations urgently through air quality awareness campaigns and decisive action to reduce air pollution. It is useless for the Government to imply, as it does, that others alone must deliver the solutions when the Government cannot seem to set a robust and consistent framework and meet even its basic reporting requirements never mind its full legal obligations. In considering its response to the current consultation, CCAL has researched information on various websites and is sharing them in this letter particularly for the ease of others investigating this subject. The site information archive includes the individual automatic sites with detailed supporting information (including grid reference, pollutants measured, monitoring start date, links to the monitoring data). Conveniently, they can be viewed using a map (Google Maps), satellite photographs or a hybrid of the two. The whole AURN can also be viewed through a Google Earth link on the site information archive home page. The zone codes are exactly the same in both the reporting questionnaires (2001-2006) and the reports on plans and programmes (2001-2005) because the same zones have been used throughout the UK assessment since the First Daughter Directive and subsequent Directives have come in. A site code remains the same throughout for the reporting questionnaires and reports on plans and programmes. Each site has its own unique code – these are used in the European Environment Agency’s Airbase database of all the Member States measurements. If a site moves or is closed then it no longer appears in years subsequent to its move or closure. New sites are assigned a unique code in the first year they are reported to the Commission. Simply click on the area of the map in which you are interested and then a particular air quality monitoring station. You will see on these sites that Marylebone Road breached the EU legal limit annual mean in 2005 and to a greater extent in 2006. Bradford, Camden and Marylebone Road breached EU legal limits for the number of daily exceedances in 2005 and they were joined by Glasgow, Port Talbot (which was on the margin) and Scunthorpe Town in 2006. Amongst other things, these outcomes show a consistent and worsening trend for particulate matter in the UK. Furthermore, given that these sites are representative of their cities, there are clearly many people adversely affected by the air pollution problems. CCAL wishes to thank Defra’s EU and International Air Quality team for helping it to find much of this information in response to a Freedom of Information request. ·NO2 Hourly mean concentration – Exceedance of the LV + MOT at Marylebone Road with 210 exceedances (compared to 18 allowed). ·NO2 Annual mean concentration – 35 exceedances in the UK of the LV + MOT with Urban Background exceedances in West London, London Bloomsbury, London Lewisham and London Wandsworth with an estimated 1,070,760 people and 119 km2 exposed to a level above the Limit Value. 24 km2 modelled exceedance of the LV + MOT. Urban Roadside exceedances of the annual mean NO2 LV + MOT in the Greater London Urban Area at Camden Roadside, Marylebone Road, London A3 Roadside, Cromwell Road 2, Southwark Roadside and Tower Hamlets Roadside. PM10 Annual mean concentration – Urban Roadside exceedances of the LV occurred at Marylebone Road. CCAL is concerned that the above picture creates a misleading impression for the Commission since: data from many sites in the excellent LAQN is apparently excluded from the sample; not all of those even monitor all air pollutants; and not enough monitoring takes place. Please note, for example, the busy Brompton Road which the LAQN says had 121 exceedances of the hourly mean NO2 greater than 250 ug/m3 in 2005 (compared to 18 allowed). With a high correlation also between PM10 air pollution levels and NO2 such sites should appear in both sets of data submitted by Defra to the Commission. On time scale of reduction, Defra says: “Time scale is that required by the Directive”. On a time scale of reduction, Defra says: “Time scale for delivery is the same as that required by the Directive”. “The Strategy is subject to regular review” Question: When is the next review planned? On timescale of reduction, Defra says: This section is left blank. Question: How can we comment on this? The subsequent 2004/224/EC Commission Decision made clear that where limit values and/or limit values plus the margin of tolerance are exceeded that the plans and programmes must include at least the information listed in Annex IV to Directive 1996/62/EC. The information in the draft report on plans and programmes does not include, for example, an “Estimate of the improvement of air quality planned and of the expected time required to attain these objectives” and so does not comply with these legal obligations. Furthermore, given that the proposed new EU Air Quality Directive may not now proceed (given that CCAL and others say they do not want it unless it meets certain minimum standards) and that, even if it does, it would not be implemented until 2008 the UK will still be required as planned to submit the plans and programmes to the Commission by 31 December 2007 whatever happens. Please ensure that the report so submitted does comply in full with Annex IV and send us a final version of it. We object to Defra’s reference in paragraph 3.1 (on page 7) to “Where the attainment date of a limit value has passed, the intention of the plan or programme is to ensure compliance in the shortest time possible”. Does this ambiguous wording refer to “Government’s intention”? The proposed new EU Air Quality Directive may include a reference to “keep the non-attainment period as short as possible” but we have found not such “let-out” wording in either the AQ FWD or the subsequent 2004/224/EC Commission Decision. None of the responses proposed by Defra (or DfT) for either breaches of PM10 limit values or NO2 breaches of limit values plus a margin of tolerance (“Timescale is that required by the Directive”; “Various measures outlined”; “Not determined”; or “As soon as possible”) meet the spirit or strict requirement of the above legal obligations. It is only finally on page 10 of the consultation document that it says “Although not stated in the Directive, where the attainment date of a limit value has passed, the intention of a plan or programme is to ensure compliance in the shortest time possible”. There are no references in the consultation document making clear that “no time extensions” are allowed under the Directive. With the greatest respect, please tell us urgently if, as the responsible Secretaries of State, either or both of you: (i) disagree with this legal analysis; or (ii) agree with it but the Government does not intend to comply with the legal requirement. First, as highlighted earlier, Defra is undertaking and reporting upon too little monitoring. Why are so few sites included e.g. only one for the NO2 hourly mean and four for the PM10 annual mean? Furthermore, the extensive reliance on modelling has an inevitable weakness in that it will tend to smooth out the peaks that occur in real life and have a serious health impact on citizens. ·Second, it has been difficult to comment on parts of the draft report since it includes gaps e.g. estimates of the total population exposed to a level above the LV in the reference year. ·Third, why has Defra in the footnote on page 10 referred to an exceedance of the SO2 24- hour limit value in a way that creates the impression that it is not serious or ongoing? It is only on pages 47 to 50 that Defra makes clear that the breaches of EU legal limits for SO2 relate to the Commission’s first written warning sent well before this draft consultation was published. CCAL considers such lack of transparency lamentable. ·Fourth, why is the “plans and programmes” section, in the annex of the draft report, full of circular references that mean nothing e.g. “Time scale is that required by the Directive” (when Defra knows that no time scale is specified in the Directive)? Fifth, why is Defra proposing to submit only a draft report to the Commission by 31 December when the obligation seems to be to submit a final report by that date. CCAL therefore registers formally here its objection to such an inadequate approach. For the record, CCAL has not seen any evidence yet that the Government has produced a package of plans and/or programmes which, when taken together, will meet EU legal limits for PM10 or NO2 throughout London. Indeed, CCAL considers that the Government has not yet made reasonable efforts to address this often repeated concern. For this reason, inter alia, CCAL continues to urge Commission Dimas to take tough enforcement action against the UK as a Member State in respect of all its breaches of EU air quality legal obligations. CCAL considers, in answer to Defra’s Question 1 on page 7 of the consultation report, “Does the report on plans and programmes to the European Commission accurately reflect the position in the UK”, that the report does not accurately reflect the position in the UK e.g. Brompton Road. It reflects accurately the position in the UK only to the extent that it shows that the UK Government does not have the political will necessary to meet its obligations under the EU Air Quality Directives to protect the health of its citizens. The question Defra should have asked for example was “Does the report etc show how and when the UK will meet EU legal limits for air quality?” The answer to that more proper question would clearly be “No, it does not”. CCAL records formally in this letter that it would be unacceptable for the UK Government to submit a report to the Commission that does not meet the minimum requirements of Annex IV of the Air Quality Framework Directive (1996/62/EC) (AQ FWD) which include an “estimate of the improvement of air quality planned and of the expected time required to attain these objectives”? We urge the Commission to take infringement action against the UK if it fails to meet fully these clear legal requirements. With air quality recognised by the European Environment Agency as the biggest environmental health risk, with the Royal Commission on Environmental Pollution estimating in March 2007 that it caused some 24,000 people premature deaths in the UK in 1995/96 compared to some 617 nationally only for passive workplace related smoking and 3,172 deaths per annum nationally from road traffic accidents (2006 data), it is wholly unacceptable that the Government should continue to lack the political will necessary to meet legally binding commitments made nearly 10 years ago. It is time the Government stopped relying solely on business or citizens to make up for its own “lack of grip” in this crucial area.